"Formal equivalence" redirects here. For the electronic design automation process, see Formal equivalence checking. Dynamic equivalence and formal equivalence are two dissimilar translation techniques used to achieve differing levels of literalness between the original and target languages of a text. Both of these techniques are used in biblical translation. The two terms have often been understood fundamentally as sense-for-sense translation (translating the meanings of phrases or whole sentences) and word-for-word translation (translating the meanings of words and phrases in a more literal method). Formal equivalence tends to emphasize fidelity to the lexical details and grammatical structure of the original language, whereas dynamic equivalence tends to employ a more natural rendering but with less literal accuracy. According to Eugene Nida, dynamic equivalence is the "quality of a translation in which the message of the original text has been so transported into the receptor language that the response of the receptor is essentially like that of the original receptors." The desire is that the reader of both languages would understand the meanings of the text in a similar fashion. In later years, Nida distanced himself from the term "dynamic equivalence" and preferred the term "functional equivalence". The term "functional equivalence" suggests not just that the equivalence is between the function of the source text in the source culture and the function of the target text (translation) in the target culture, but that "function" can be thought of as a property of the text. It is possible to associate functional equivalence with how people interact in cultures. Because dynamic equivalence eschews strict adherence to the grammatical structure of the original text in favor of a more natural rendering in the target language, it is sometimes used when the readability of the translation is more important than the preservation of the original grammatical structure. Formal equivalence is often more goal than reality, if only because one language may contain a word for a concept which has no direct equivalent in another language. In such cases, a more dynamic translation may be used or a neologism may be created in the target language to represent the concept (sometimes by borrowing a word from the source language). The more the source language differs from the target language, the more difficult it may be to understand a literal translation without modifying or rearranging the words in the target language. On the other hand, formal equivalence can allow readers familiar with the source language to analyze how meaning was expressed in the original text, preserving untranslated idioms, rhetorical devices (such as chiastic structures in the Hebrew Bible) and diction in order to preserve original information and highlight finer shades of meaning. Translators of the Bible have taken various approaches in rendering it into English, ranging from an extreme use of formal equivalence, to extreme use of dynamic equivalence. Holman Christian Standard Bible called "optimal equivalence"
↑ Nida, Eugene A., and Charles R. Taber. (1969). The Theory and Practice of Translation, With Special Reference to Bible Translating, 200. Leiden: Brill. ↑ Translation and religion: holy untranslatable? p91 Lynne Long – 2005 "In order to avoid certain misunderstandings, de Waard and Nida (1986: 7, 36) later replaced the term 'dynamic equivalence' with 'functional equivalence', but they stated clearly that 'The substitution of "functional equivalence"' is not..."
↑ The History of the Reina-Valera 1960 Spanish Bible p98 Calvin George – 2004 "190 For this reason in his later writings he distanced himself from the term 'dynamic equivalence,' preferring instead 'functional equivalence.' 191 The idea is to produce the closest natural equivalent in the target or 188 190 Nida, ..."
↑ Data collected from two sources that have nearly identical ranking with an overlapping (supplemental) list of translations studied: 1. 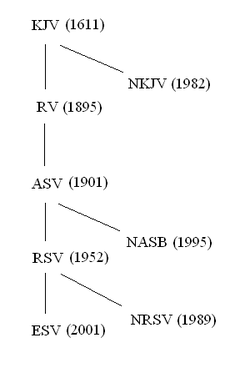 Thomas, Robert L., Bible Translations: The Link Between Exegesis and Expository Preaching, pages 63ff; and 2. Clontz, T.E. and Clontz, J., The Comprehensive New Testament, page iii. ↑ Barker, Kenneth L. "The Balanced Translation Philosophy of the TNIV". Retrieved 2007-11-29.